The dates for AAA Boys Soccer and both A Girls and Boys Soccer have changed. Boys & Girls A Soccer are now May 30/31. We have a new twitter account for tweeting tournament results. 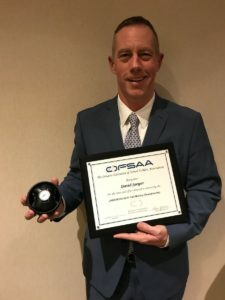 Congratulations to David Jaeger, CWOSSA Vice President and Vice Principal at St. Benedict SS for receiving the OFSAA Leadership in Sport Award for Girls “AAA” Hockey. David has been very involved with girls hockey over the years and this year he convened the Girls “AAA” Hockey OFSAA Hockey Championship in Cambridge. 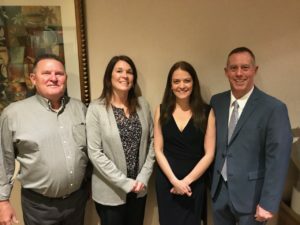 David is pictured here at the OFSAA Hockey Banquet with Brian Henry (CWOSSA Executive Director), Pam Robinson (CWOSSA OFSAA Girls Rep) and Tanya Byers (CWOSSA President).